A great way to keep countertop, table tops, or desktops organized and clear while adding a touch of personal style. The foldable rack organizer offers 2 open wire shelves for easy accessibility to bottom or top shelf stored items. A multifunctional design that can complement most room decor while offering storage space for a wide variety of items. Perfect to store kitchen spices and seasonings, bath & beauty essentials, crafting supplies, display small figurines or small potted plants & more. Full metal frame with a matte black finish. Neutral color scheme and design to match most home decor style. Lightweight and low profile, the folded unit takes up minimal space for storage. Simply unfold the rack and secure shelves into the side hooks, its that easy. 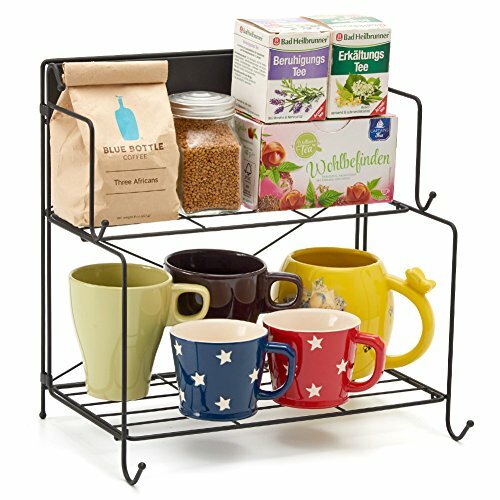 [ KITCHEN & HOME ORGANIZER ]: Constructed of durable iron, the EZOWare 2 Tier Foldable Spice Rack provides a storage solution to organize the majority of glass or plastic bottles, jars, and smaller items, and declutter the mess in your home. [ FOLDABLE DESIGN ]: Easy set up in a minute. Space saving design allows effortless storage when not in use, takes up minimum space. Folded size: 11.5 x 11.75 x 1.57 inches (29.2 x 29.8 x 4 cm). [ ATTRACTIVE ]: Neutral black color scheme with half-scroll accents to match personal style and kitchen or home decor. There is an 11.5 x 1.75 inches blank plate on the top shelf you can personalize yourself or use to attach magnets or magnetic items. [ EASY ACCESS ]: Top Shelf Measures 11.3" L x 3.46" D, Bottom Shelf Measures 11.3"L x 6" D x 5.5" H. Two shelves with different depths make it easy to find, access, or place your items. Please note: Spice Jars are NOT included. [ MULTI-FUNCTIONAL ]: Durable metal with fashionable black finish design can be utilized in any place of the house, including: cabinet, coffee table, kitchen countertop, craft room, living room and more. Perfect to organize and display your spice jars, seasoning containers, small tea pots, loose tea leaf, dry goods, small herbs, snacks, energy bars and other small items. If you have any questions about this product by EZOWare, contact us by completing and submitting the form below. If you are looking for a specif part number, please include it with your message.